(CN) – The first of several investigations into the deadliest set of wildfires in California history has concluded downed power lines are responsible for at least two fires that ripped through the Wine Country city of Santa Rosa this past October. The Santa Rosa Fire Department said loose power lines moving about during high and erratic winds sparked a blaze in nearby vegetation and created at least two separate wildfires within city limits. “Ignition of vegetation resulted from the arcing power lines that were damaged by the extreme winds, spreading fire upslope and into the two structures,” said Scott Moon, a fire marshal, in the narrative portion of the investigation released to Courthouse News. The report represents the first finished investigation into several fires that broke out across Northern California beginning on Oct. 8 and which burned for the better part of the month. Approximately 17 wildfires were reported across the northern portion of the state, including areas of Napa, Lake, Sonoma, Mendocino, Butte and Solano counties. More than 44 people died in the fires, which moved rapidly and unpredictably due to gusty and unpredictable winds. The fires also created more than $9.5 billion in insured losses and have cost the economy around $85 billion. 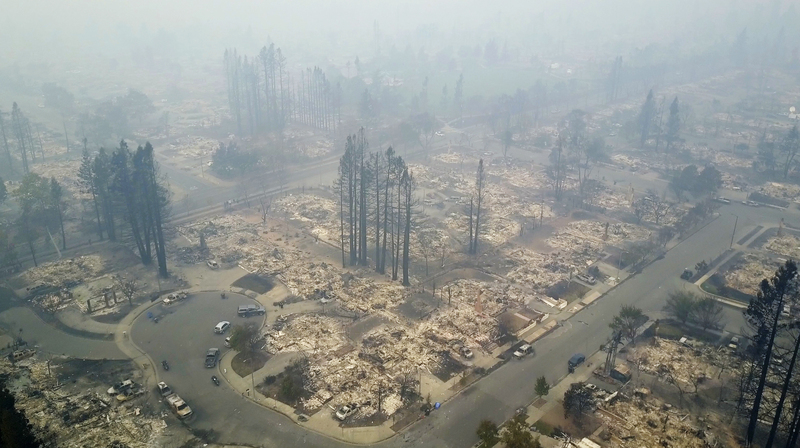 Santa Rosa bore the brunt of the damage, as the Tubbs Fire ripped through and killed 22 residents and destroyed 2,800 homes – 5 percent of its total housing stock. The two fires investigated by Santa Rosa Fire occurred before the Tubbs Fire, which started outside the city of Calistoga and moved west. The first of the two blazes broke out on Sullivan Way near Annandale State Park on the east side of town. The second fire only burned portions of a Montessori school property on Brush Creek. In both cases, Moon determined that arcing power lines, caused by the velocity of the wind, sparked nearby dry vegetation. That same wind then fanned the flames. The fire on Sullivan Way destroyed one large house and damaged another, while the fire on the school grounds resulted in the loss of a chicken coop and trees on the northeast part of the property. Cal Fire is still investigating the cause of the other large wildfires that ravaged portions of the Wine Country. Utility giant PG&E filed incident reports with the California Public Utilities Commission detailing at least eight incidents of downed power lines on the night of Oct. 8, and transcripts from police scanners show reports of exploding transformers near some of the fires. “There has been no determination by Cal Fire on the causes of any of the fires and we remain focused on doing everything we can to help Sonoma and Napa counties recover and rebuild,” PG&E spokesman Ari Vanrenen said in a statement Monday. To date, hundreds of lawsuits have been filed against PG&E, despite the absence of a definitive conclusion from Cal Fire. The suits could be consolidated and are slated to be heard in the San Francisco Superior Court. Last week, the Sonoma County Board of Supervisors voted unanimously to form a legal group that will sue PG&E for as much as $25 million. Other Northern California counties are expected to join the suit or file similar ones. The lawsuits claim PG&E failed to adequately maintain their power lines against the eventuality of a high wind event. The investor-owned utility company suspended dividends for its investors in December, citing the potential liability stemming from the late October firestorm. Meanwhile, the Little Hoover Commission, an independent state oversight agency, said insufficient forest management practices are to blame for the spate of wildfires afflicting the state. “A century of mismanaging Sierra Nevada forests has brought an unprecedented environmental catastrophe that impacts all Californians and with it, a rare opportunity for transformational culture change in forest management practices,” said Pedro Nava, the chair of the commission. Forests need more prescribed burns and other thinning operations to make them more resilient to both drought and the type of wildfires that caused unprecedented damage in 2017. In addition to the deadliest fire in Northern California, the Thomas Fire in Southern California became the state’s largest ever by acreage, burning about 280,000 acres mostly in Santa Barbara and Ventura counties.